“Leakproof” Bags are constructed of flame retardant vinyl specially formulated to be launderable. Ultrasonically welded and reinforced seams assure leakproof performance and durable long life. Bags have shock corded rim and envelope closure. Choice of bag color. 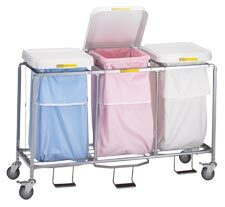 All deluxe hampers are constructed from 7/8 tubular steel with a sturdy chrome finish and 4 casters (2 swivel/2 locking brake casters). All units ship knocked-down.